– Today’s biggest news is probably David West’s decision to opt-out of his contract and test the free agency waters. Could the Nets be interested? We reported on it a few months ago. He’s certainly a great fit. Kris Humphries is still fairly unproven. Humphries coming off the bench would be great for the Nets’ depth. That’s where the one-year-wonder belongs on a playoff team. Now I love Humphries and have defended him since he was acquired. But I’m just not sold he can be a consistent impact player. Could he be? Of course. But I’d rather have him right now as my second power forward. – David West leaving the Hornets will almost guarantee Chris Paul will not be a Hornet in 2012-2013. There’s no way he would have stayed anyway. Losing West is just another reason to leave. – Contrary to West, Tim Duncan won’t opt-out of his deal. No surprises there. The Spurs are the Devils of the NBA. They’ll still be good next year, and for years to come as long as Duncan is there. Think of Duncan as Martin Brodeur. Once either one of those guys leave, a massive rebuilding/retooling phase will be necessary. But until then, their teams will be extremely competitive. – According to sources, Dave Checketts, a former president of the Knicks, will serve as a basketball consultant to the Detroit Pistons. – Derek Jeter resumed batting practice and running yesterday. That’s good news for the Yankees. – Deion Branch and Eli Manning both expressed optimism yesterday for a new CBA. I think it’s safe to say a deal will be reached, probably within the next two weeks or so. – I, as well as many others, wholeheartedly believe Brad Richards will be a Ranger come Friday. I’ve said it multiple times. However, the Leafs and Lightning still both think they’ve got decent shots. Still, it will be a major upset if someone can prevent Richards from wearing red, white, and blue next season. – Chris Drury was not placed on waivers today, which would have been the first step towards buying him out. – Brooks Laich was signed to a ridiculous 6 year, $27 million per deal by the Caps this this morning. Hilarious. – The Penguins hope to reach a agreement on a one-year deal with former Ranger Jaromir Jagr before Friday. As always, feel free to follow us on Twitter and Facebook for the latest breaking news on all things New York sports. Three days until Brad Richards is a Ranger. Knicks Targeting Dalembert and Redd? While Kris Humphres frolics in Mexico, the Knicks are thinking about pursuing Samuel Dalembert and/or Michael Redd. I think these are two good players, but you can’t sacrifice cap space for 2012. If the Knicks can get Chris Paul, they have to try to sign him. You can’t do that with the mid level exception. Redd isn’t really needed, but it’s Dalembert that I really like. The 6’11 center would fit exactly what the Knicks need. Unfortunately, a multi-year deal could hurt your chances at Chris Paul. But you could look at it the other way as well. If you sign one of these guys and they play well, it’s another asset you have on the table. Heck, either one could actually help you get Paul. What team couldn’t use players like Dalembert and Redd? On the other hand, if either gets hurt during their first year of a multi-year deal, you are in huge trouble. It’s a complicated issue, but the Knicks have to do something. I’m not in favor of a panic move or a move just for the sake of making one, but something has to be done. I think Dalembert would be a great fit for the Knicks, although there is a bit of a risk with signing him if he costs a lot. However, this is all just nonsense talk until we get the new CBA in order. Once a new agreement is made between the league and the players, we can really start to seriously discuss free agency. Where will Samuel Dalembert take his talents? Knicks looking to acquire Chris Paul or Dwight Howard? Appropriately, Chris Paul and Dwight Howard finished their seasons an hour apart Thursday night, both of their teams exiting in the first round of the playoffs. That immediately kicked off speculation on whether the Hornets and Magic will attempt to trade their point guard and center, respectively, next season before they reach free agency in 2012. The Knicks better hope not. After dealing most of their assets in the Carnelo Anthony package in February, the Knicks likely will be ill-equipped to muster up a suitable package to land Paul or Howard via trade. Like they wished with Anthony, the Knicks must hope Paul and Howard reach 2012 free agency, when they will have plenty of cap spaceTeam president Donnie Walsh’s hopes of Anthony staying the course did not materialize. Anthony decided he did not want to test 2011 free agency because of fears of the new and yet-to-be determined collective bargaining agreement. The Knicks would have had maximum cap room this summer but were forced into the Anthony trade, costing them Danilo Gallinari, Raymond Felton, Wilson Chandler, Timofey Mozgov, Anthony Randolph, their 2014 first-round pick and two second-round picks. Left to wheel and deal next season is Chauncey Billups’ $14.2 million expiring contract, rookie guard Landry Fields whomever the Knicks select with the 17th pick in the upcoming draft. That’s not much, and the cupboard of additional first-round picks is bare. The Knicks are not permitted to deal their 2013 first-round pick since they no longer possess their 2012 pick (Houston property) and 2014 selection (Denver). Paul, who last July at Anthony’s New York wedding toasted to a union with Anthony and Amar’e Stoudemire, sounds as if he could be willing to stick it out next season in New Orleans, despite a shaky ownership situation in which the NBA owns the team. After the Hornets were eliminated by the Lakers, Paul said the club is “definitely serious about winning” and praised the administration and coaching. He clearly is a fan of Monty Williams. “In the past, we had GMs and coaches that didn’t communicate, so not only do they communicate, they know basketball,” said Paul, who recently suggested he would think about heading back to his native North Carolina and play for Michael Jordan’s Bobcats. But the sentiment is he would prefer New York and make good on his wedding toast. Paul’s agency, CAA, which also represents Anthony, figures to want to steer Paul to New York and must realize the advantages of doing so as a 2012 free agent. Howard is a different story. He has given no signals the Knicks are a preferred destination, complaining about the cold weather. During breakup day yesterday, Howard was asked if he needed to play in a major metro market to maximize his visibility. Howard’s answer did not reflect well on the Knicks’ 2012 chances. Obviously the Knicks should do everything they can to acquire either Paul or Howard. If they could somehow get both, that would be unbelievable. But unfortuantely, the cap will only allow them to barely get one. If I had to choose, I’d take Chris Paul. Dwight Howard is one of my favorite players, but you need that star point guard to run the show. It’s over. The Knicks have been swept by the Celtics. This is obviously an embarrassing loss, but it should be a fun offseason ahead. D’Antoni has to go, but we all know Dolan doesn’t have the guts to fire him. Hopefully the Knicks can land Marc Gasol or convince the Hornets to trade Chris Paul, although the latter is a bit improbable. I would like to say I’m sure it will all work out for the better, but honestly I don’t trust this franchise to do the right thing anymore. For more on the Knicks and their future, see my rant this week on them. 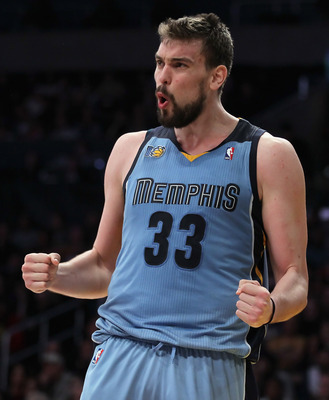 The official New York Sports Today "Marc Gasol to the Knicks" campaign starts now. Knicks to Trade Stat or Melo for Howard? Howard can become a free agent after the 11-12 season, and the Magic will be nervously waiting for the NBA’s most dominant big man to make a decision. If they don’t want to wait and risk losing him without compensation, the Magic could listen to trade offers for Howard next season. Don’t get this at all. Why would the Knicks trade Amar’e or Melo for Howard? They’ve worked this hard to lock up two stars. The goal is to bring a third, not to just have two. I ultimately think Howard will go to the Lakers and I think Chris Paul will come to The Garden. I wouldn’t rule out Paul teaming up in Orlando with Howard, but I see Paul going to New York and Deron Williams staying in what then will be Brooklyn. I love Dwight, but he's not worth trading for if it means giving up Stoudemire or Anthony.